Sir Philip Pullman, CBE, FRSL, is an English novelist. He is the author of several best-selling books, including the fantasy trilogy His Dark Materials and the fictionalised biography of Jesus, The Good Man Jesus and the Scoundrel Christ. In 2008, The Times named Pullman one of the "50 greatest British writers since 1945". In a 2004 poll for the BBC, Pullman was named the eleventh most influential person in British culture. The first book of Pullman's His Dark Materials trilogy, Northern Lights, won the 1995 Carnegie Medal from the Library Association, recognising the year's outstanding English-language children's book. For the 70th anniversary of the Medal it was named one of the top ten winning works by a panel, composing the ballot for a public election of the all-time favourite. It won the public vote from that shortlist and was thus named the all-time "Carnegie of Carnegies" in June 2007. It was adapted as a film under the book's US title, The Golden Compass. Philip Pullman was born in Norwich, England, the son of Audrey Evelyn Pullman (née Merrifield) and Royal Air Force pilot Alfred Outram Pullman. The family travelled with his father's job, including to Southern Rhodesia, though most of his formative years were spent in Llanbedr in Ardudwy, North Wales. His father, an RAF pilot, was killed in a plane crash in 1954 in Kenya when Pullman was seven, being posthumously awarded the Distinguished Flying Cross (DFC). Pullman said at the beginning of a 2008 exchange that to him as a boy, his father "was a hero, steeped in glamour, killed in action defending his country" and had been "training pilots". Pullman was then presented with a report from The London Gazette of 1954 "which carried the official RAF news of the day [and] said that the medal was given for 'gallant and distinguished service' during the Mau Mau uprising. 'The main task of the Harvards [the aircraft flown by his father's unit] has been bombing and machine-gunning Mau Mau and their hideouts in densely wooded and difficult country.' This included 'diving steeply into the gorges of [various] rivers, often in conditions of low cloud and driving rain.' Testing conditions, yes, but not much opposition from the enemy, the journalist in the exchange continued. Very few of the Mau Mau had guns that could land a blow on an aircraft." Pullman responded to this new information, writing "my father probably doesn't come out of this with very much credit, judged by the standards of modern liberal progressive thought" and accepted the new information as "a serious challenge to his childhood memory." His mother remarried, and with a move to Australia came Pullman's discovery of comic books including Superman and Batman, a medium which he continues to espouse. Pullman attended Taverham Hall and Eaton House in his early years, and from 1957 he was educated at Ysgol Ardudwy in Harlech, Gwynedd, and spent time in Norfolk with his grandfather, a clergyman. Around this time Pullman discovered John Milton's Paradise Lost, which would become a major influence for His Dark Materials. From 1965, Pullman attended Exeter College, Oxford, receiving a Third class BA in 1968. In an interview with the Oxford Student he stated that he "did not really enjoy the English course" and that "I thought I was doing quite well until I came out with my third class degree and then I realised that I wasn't — it was the year they stopped giving fourth class degrees otherwise I'd have got one of those". He discovered William Blake's illustrations around 1970, which would also later influence him greatly. Pullman married Judith Speller in 1970 and began teaching children aged 9 to 13 at Bishop Kirk Middle School in Summertown, North Oxford and writing school plays. His first published work was The Haunted Storm, which was joint-winner of the New English Library's Young Writer's Award in 1972. He nevertheless refuses to discuss it. Galatea, an adult fantasy-fiction novel, followed in 1978, but it was his school plays which inspired his first children's book, Count Karlstein, in 1982. He stopped teaching shortly after the publication of The Ruby in the Smoke (1986), his second children's book, which has a Victorian setting. Pullman has been writing full-time since 1996. He continues to deliver talks and writes occasionally for The Guardian, including writing and lecturing about education, where he is often critical of unimaginative education policies. He was awarded a CBE in the New Year's Honours list in 2004. He also co-judged the Christopher Tower Poetry Prize (awarded by Oxford University) in 2005 with Gillian Clarke. In 2004, he was elected President of the Blake Society. In 2004 Pullman also guest-edited The Mays Anthology, a collection of new writing from students at the Universities of Oxford and Cambridge. In 2005 Pullman won the annual Astrid Lindgren Memorial Award from the Swedish Arts Council, recognising his career contribution to "children's and young adult literature in the broadest sense". According to the presentation, "Pullman radically injects new life into fantasy by introducing a variety of alternative worlds and by allowing good and evil to become ambiguous." In every genre, "he combines storytelling and psychological insight of the highest order." He was one of five finalists for the biennial, international Hans Christian Andersen Medal in 2006 and he was the British nominee again in 2012. In 2008, he started working on The Book of Dust, a companion book to his His Dark Materials trilogy, and "The Adventures of John Blake", a story for the British children's comic The DFC, with artist John Aggs. On 24 June 2009, Pullman was awarded the degree of D. Litt. (Doctor of Letters), honoris causa, by the University of Oxford at the Encænia ceremony in the Sheldonian Theatre. In 2012, during a break from writing The Book of Dust, Pullman was asked by Penguin Classics to curate 50 of Grimms' classic fairytales, from their compendium of over 200 stories. "They are not all of the same quality", said Pullman. "Some are easily much better than others. And some are obvious classics. You can't do a selected Grimms' without Rumpelstiltskin, Cinderella and so on." Beginning in August 2013, Pullman was elected President of the Society of Authors - the "ultimate honour" awarded by the British writers body, and a position first held by Alfred, Lord Tennyson. The first volume of Pullman's trilogy The Book of Dust was published by Penguin Random House Children's and David Fickling in the UK and by Random House Children's in the US on 19 October 2017. The as-yet-unnamed second title in The Book of Dust will include a character named after Nur Huda el-Wahabi, a 16-year-old victim of London's tragic Grenfell Tower fire. 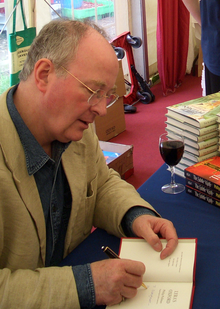 As part of the charity auction Authors for Grenfell Tower, Pullman offered the highest bidder a chance to name a character in the upcoming trilogy. Ultimately, he raised £32,400 to provide relief for survivors of the Grenfell disaster. Pullman was named a Knight Bachelor in the 2019 New Year's Honours list. In March 2019, the charity Action for Children's Art presented Pullman with their annual JM Barrie Award to mark a "lifetime's achievement in delighting children". His Dark Materials is a trilogy consisting of Northern Lights (titled The Golden Compass in North America), The Subtle Knife and The Amber Spyglass. Northern Lights won the Carnegie Medal for children's fiction in the UK in 1995. The Amber Spyglass was awarded both 2001 Whitbread Prize for best children's book and the Whitbread Book of the Year prize in January 2002, the first children's book to receive that award. The series won popular acclaim in late 2003, taking third place in the BBC's Big Read poll. Pullman later wrote two companion pieces to the trilogy, entitled Lyra's Oxford and Once Upon a Time in the North. A third companion piece Pullman refers to as the "green book" will expand upon his character Will. La Belle Sauvage was published in October 2017 and is the beginning of a new trilogy, The Book of Dust, which will include characters and events from His Dark Materials. Pullman has narrated unabridged audiobooks of the three novels in the His Dark Materials trilogy; the other parts are read by actors, including Jo Wyatt, Steven Webb, Peter England, Stephen Thorne and Douglas Blackwell. In a discussion on fantasy as escapism, Pullman admitted he never reads fantasy as "it's not satisfying". He then went on to argue that he sees His Dark Materials as "stark realism", not fantasy. Pullman has been a vocal campaigner on a number of book-related and political issues. In 2008, Pullman led a campaign against the introduction of age bands on the covers of children's books, saying: "It's based on a one-dimensional view of growth, which regards growing older as moving along a line like a monkey climbing a stick: now you're seven, so you read these books; and now you're nine so you read these". More than 1,200 authors, booksellers, illustrators, librarians and teachers joined the campaign; Pullman's own publisher, Scholastic, agreed to his request not to put the age bands on his book covers. Joel Rickett, deputy editor of The Bookseller, said: "The steps taken by Mr Pullman and other authors have taken the industry by surprise and I think these proposals are now in the balance". In 2014, Pullman supported the Let Books Be Books campaign to stop children's books being labelled as "for girls" or "for boys", saying: "I'm against anything, from age-ranging to pinking and blueing, whose effect is to shut the door in the face of children who might enjoy coming in. No publisher should announce on the cover of any book the sort of readers the book would prefer. Let the readers decide for themselves". Pullman has a strong commitment to traditional British civil liberties and is noted for his criticism of growing state authority and government encroachment into everyday life. In February 2009, he was the keynote speaker at the Convention on Modern Liberty in London and wrote an extended piece in The Times condemning the Labour government for its attacks on basic civil rights. Later, he and other authors threatened to stop visiting schools in protest at new laws requiring them to be vetted to work with youngsters—though officials claimed that the laws had been misinterpreted. In July 2011, Pullman was one of the lead campaigners signing a declaration which called for a 1,000-strong "public jury", selected at random, to draw up a "public interest first" test to ensure that power is taken away from "remote interest groups". The declaration was also signed by 56 academics, writers, trade unionists and politicians from the Labour Party, the Liberal Democrats and the Green Party. In October 2011, Pullman backed a campaign to stop 600 library closures in England calling it a "war against stupidity". Of the London Borough of Brent’s claims that it was closing half of its libraries to fulfil its 'exciting plans’ to improve its library service Pullman said: "All the time, you see, the council had been longing to improve the library service, and the only thing standing in the way was – the libraries”. The book is second only to the wheel as the best piece of technology human beings have ever invented. A book symbolises the whole intellectual history of mankind; it's the greatest weapon ever devised in the war against stupidity. Beware of anyone who tries to make books harder to get at. And that is exactly what these closures are going to do – oh, not intentionally, except in a few cases; very few people are stupid intentionally; but that will be the effect. Books will be harder to get at. Stupidity will gain a little ground. New media and new forms of buying and lending are all very interesting, for all kinds of reasons, but one principle remains unchanged: authors must be paid fairly for their work. Any arrangement that doesn't acknowledge that principle is a bad one, and needs to be changed. That is our whole argument. Surely it isn’t beyond the resources of a nation that can spend enormous amounts of money on acts of folly and unnecessary warfare, a nation that likes to boast about its literary heritage, to find the money to pay for a proper memorial and a centre for the study of this great poet and artist. Not least because this is the place where he wrote the words now often sung as an alternative (and better) national anthem, the poem known as Jerusalem: "And did those feet in ancient time". Blake’s feet walked in Felpham. Let’s not let this opportunity pass by. As president of the Blake Society, on 11 August 2018 Pullman inaugurated Blake's new memorial gravestone on the site of his grave in Bunhill Fields, following a long campaign by the society. In January 2016, Pullman resigned as patron of the Oxford Literary Festival after five years, saying that its continued refusal to pay authors fees for appearing as guest speakers at the event placed him in an "awkward position" because it conflicted with his presidency of the Society of Authors, which campaigns for authors to be paid for appearing at book festivals. He made the announcement on Twitter, saying that he had made lengthy attempts to persuade the Festival to pay authors, "but they won't. Time to go". Reporting Pullman's decision, UK daily newspaper The Independent noted, "The Authors' Licensing and Collecting Society found in 2014 that the average earnings of a professional full-time author is just £11,000". Although Pullman has stated he is "a Church of England atheist, and a 1662 Book of Common Prayer atheist, because that's the tradition I was brought up in", he has also said he is technically an agnostic. He has singled out elements of Christianity for criticism: "if there is a God, and he is as the Christians describe him, then he deserves to be put down and rebelled against." However, he said that his argument can extend to all religions. Pullman has also referred to himself as knowingly "of the Devil's party", a reference to William Blake's revisionist view of Milton in The Marriage of Heaven and Hell. Pullman is a supporter of Humanists UK and an Honorary Associate of the National Secular Society. In 2011 he was given a services to Humanism award by the British Humanist Association for his contribution as a longstanding supporter. On 15 September 2010, Pullman, along with 54 other public figures (including Stephen Fry, Professor Richard Dawkins, Terry Pratchett, Jonathan Miller and Ken Follett), signed an open letter published in The Guardian stating their opposition to Pope Benedict XVI being given "the honour of a state visit" to the UK; the letter argued that the Pope had led and condoned global abuses of human rights, leading a state which has "resisted signing many major human rights treaties and has formed its own treaties ("concordats") with many states which negatively affect the human rights of citizens of those states". New Yorker journalist Laura Miller described Pullman as one of England's most outspoken atheists. He has characterised atheist totalitarian regimes as religions. Alan Jacobs (of Wheaton College) said that in His Dark Materials Pullman replaced the theist world-view of John Milton's Paradise Lost with a Rousseauist one. The books in the series have been criticised for their attitude to religion, especially Catholicism, by the Catholic League for Religious and Civil Rights and Focus on the Family. "[by] co-opting Catholic terminology and playing with Judaeo-Christian theological concepts, Pullman is effectively removing, among a mass audience of a highly impressionable age, some of the building blocks for future evangelisation". Pullman was flattered and asked his publisher to include quotes from Caldecott's article in his next book. In 2002, the Catholic Herald published an article by Sarah Johnson that compared Pullman to a "playground bully" whose work "attacks a religious minority". The following year, after Benedict Allen's reference to the criticism during the BBC TV series The Big Read, the Catholic Herald republished both articles and Caldecott claimed her "bonfire" comment was a joke and accused Pullman and his supporters of quoting her out of context. In a longer article for Touchstone magazine earlier in 2003, Caldecott had also described Pullman's work as "axe-grinding" and "a kind of Luciferian enterprise". Peter Hitchens argued that Pullman pursues an anti-Christian agenda, citing an interview in which Pullman is quoted as saying: "I'm trying to undermine the basis of Christian belief." In the same interview, Pullman acknowledges that a controversy would be likely to boost sales, but continues "I'm not in the business of offending people. I find the books upholding certain values that I think are important, such as life is immensely valuable and this world is an extraordinarily beautiful place. We should do what we can to increase the amount of wisdom in the world." Hitchens also views the His Dark Materials series as a direct rebuttal of C. S. Lewis's The Chronicles of Narnia; Pullman has criticised the Narnia books as religious propaganda. Hitchens' brother Christopher Hitchens, author of God Is Not Great, praised His Dark Materials as a fresh alternative to Lewis, J. R. R. Tolkien and J. K. Rowling, describing the author as one "whose books have begun to dissolve the frontier between adult and juvenile fiction". However, he was more critical of The Good Man Jesus and the Scoundrel Christ, accusing Pullman of being a "Protestant atheist" for supporting the teachings of Christ but being critical of organised religion. Pullman has found support from some Christians, most notably Rowan Williams, the former Archbishop of Canterbury, who argued that Pullman's attacks focus on the constraints and dangers of dogmatism and the use of religion to oppress, not on Christianity itself. Williams recommended His Dark Materials for discussion in Religious Education classes, and said that "to see large school-parties in the audience of the Pullman plays at the National Theatre is vastly encouraging". Pullman and Williams took part in a National Theatre platform debate a few days later to discuss myth, religious experience and its representation in the arts. Donna Freitas, professor of religion at Boston University, argued that challenges to traditional images of God should be welcomed as part of a "lively dialogue about faith". The Christian writers Kurt Bruner and Jim Ware "also uncover spiritual themes within the books". Pullman's contribution to the Canongate Myth Series, The Good Man Jesus and the Scoundrel Christ, was described by Mike Collett-White as "a far more direct exploration of the foundations of Christianity and the church as well as an examination of the fascination and power of storytelling". In a 2017 interview with The Times Magazine, Pullman said: "The place religion has in our lives is a permanent one." He concluded that there was 'no point in condemning [religion]', and mused that it is part of the human mind to ask philosophical questions such as the purpose of life. He reiterated that it was useless to 'become censorious about [religion], to say there is no God'. He also mentioned that his novel, The Book of Dust, is based on the 'extreme danger of putting power into the hands of those who believe in some absolute creed, whether that is Christianity or Islam or Marxism'. A mini-series adaptation of I Was a Rat was produced by the BBC and aired in three one-hour instalments in 2001. A film adaptation of The Butterfly Tattoo finished principal photography on 30 September 2007. The Butterfly Tattoo is a project, supported by Philip Pullman, to allow young artists a chance to gain experience in the film industry. The film is produced by the Dutch production company Dynamic Entertainment. A co-produced BBC and WGBH Boston television adaptation of The Ruby in the Smoke, starring Billie Piper and Julie Walters, was screened in the UK on BBC One on 27 December 2006, and broadcast on PBS Masterpiece Theatre in America on 4 February 2007. The television adaptation of the second book in the series, The Shadow in the North, aired on the BBC on 26 December 2007. The BBC and WGBH announced plans to adapt the next two Sally Lockhart novels, The Tiger in the Well and The Tin Princess, for television as well; however, since The Shadow in the North aired in 2007, no information has arisen regarding an adaptation of The Tiger in the Well. A film adaptation of Northern Lights, titled The Golden Compass, was released in December 2007 by New Line Cinema, starring Dakota Blue Richards as Lyra, along with Daniel Craig, Nicole Kidman, Eva Green, Sam Elliott and Ian McKellen. A TV adaptation of His Dark Materials is currently being produced by Bad Wolf for BBC One and HBO. London's Royal National Theatre staged a two-part theatrical version of His Dark Materials in December 2003. The same adaptation has since been staged by several other theatres in the UK and elsewhere. His Dark Materials has also been adapted for radio, CD and unabridged audiobook; the unabridged audiobooks were narrated by the author. 2019 The Secret Commonwealth To be released on 3 October 2019. 2008 The Adventures of John Blake in The DFC and The Phoenix Mystery of the Ghost Ship storyline collected by David Fickling Books and in hardcover by Scholastic Inc.
^ Alternatively, six authors have won the Carnegie Medal for their Guardian Prize-winning books. Professional librarians confer the Carnegie and select the winner from all British children's books (although it was established in 1936 as a once-in-a-lifetime award). The Guardian newspaper's prize winner is selected by British children's writers, "peers" of the author who has not yet won it, for one children's (age 7+) or young-adult fiction book. Details regarding author and publisher nationality have varied. ^ "The 50 greatest British writers since 1945". The Times. 5 January 2008. Retrieved on 2016-01-03. ^ "iPod designer leads culture list". BBC. 17 November 2016. ^ "iPod designer voted UK's most influential cultural icon". The Register. 17 November 2016. ^ a b (Carnegie Winner 1995) Archived 24 December 2013 at the Wayback Machine. Living Archive: Celebrating the Carnegie and Greenaway Winners. CILIP. Retrieved 2012-07-09. ^ "70 Years Celebration: Anniversary Top Tens" Archived 27 October 2016 at the Wayback Machine. The CILIP Carnegie & Kate Greenaway Children's Book Awards. CILIP. Retrieved 2012-07-09. ^ "Philip Pullman: How Wales inspired his life and work". bbc.co.uk. 18 March 2013. Retrieved 20 March 2013. ^ Moreton, Cole (25 May 2008). "The death and absence of his father has informed so much of the fiction written by this highly acclaimed authorover the years, but he has never known – or wanted to know – the truth about what really happened. Until now... Cole Moreton meets Philip Pullman". The Independent. Archived from the original on 1 December 2008. ^ Sale, Jonathan (11 March 2004). "Passed/Failed: 'I wore a trilby to school'". The Independent. Retrieved 5 September 2017. ^ "BBC Arts & Culture - Philip Pullman: How Wales inspired his life and work". BBC Arts & Culture. ^ "University of Oxford, Cherwell newspaper Interviews: Philip Pullman". Cherwell. 2 September 2009. Archived from the original on 13 June 2009. Retrieved 2 August 2009. ^ "Guardian children's fiction prize relaunched: Entry details and list of past winners". theguardian 12 March 2001. Retrieved 2012-08-02. ^ "Common sense has much to learn from moonshine". The Guardian. Retrieved 23 December 2014. ^ "2005: Philip Pullman: Maintaining an Optimistic Belief in the Child" Archived 13 October 2012 at the Wayback Machine. The Astrid Lindgren Memorial Award. Retrieved 2012-08-13. ^ "IBBY Announces the Winners of the Hans Christian Andersen Awards 2006". International Board on Books for Young People (IBBY). Press release 27 March 2006. "Hans Christian Andersen Awards". IBBY. Retrieved 2013-07-22. ^ "2012 Awards". Hans Christian Andersen Awards. IBBY. "Philip Pullman" Archived 22 March 2014 at the Wayback Machine. IBBY. Retrieved 2013-07-20. ^ http://news.bbc.co.uk/1/hi/wales/7109377.stm. BBC News (2007-11-23). Retrieved on 2012-01-02. ^ "Philip Pullman Creative Writing Fellow for new MA". Oxford Brookes University. 11 June 2008. Archived from the original on 1 September 2008. Retrieved 26 January 2009. ^ "Philip Pullman To Host Next Waterstone's Writer's Table". booktrade.info. 2 July 2008. Retrieved 26 January 2009. ^ Honorary degrees awarded at Encaenia – University of Oxford Archived 4 July 2009 at the Wayback Machine. Ox.ac.uk. Retrieved on 2012-01-02. ^ "Philip Pullman turns to Grimm task". BBC News. ^ Alison Flood (25 March 2013). "Philip Pullman to be Society of Authors' new president". The Guardian. Retrieved 25 March 2013. ^ "Long-awaited Philip Pullman series The Book of Dust revealed | The Bookseller". www.thebookseller.com. Retrieved 15 February 2017. ^ Kean, Danuta (14 February 2017). "Philip Pullman unveils epic fantasy trilogy The Book of Dust". The Guardian. London. Retrieved 2 March 2017. ^ Carolyn Cox (29 June 2017). "Grenfell Tower Victim Nur Huda el-Wahabi to Be Honored in New Philip Pullman Trilogy". The Portalist. Retrieved 29 June 2017. ^ "New Year Honours List United Kingdom" (PDF). Retrieved 28 December 2018. ^ Flood, Alison (21 March 2019). "Philip Pullman wins JM Barrie lifetime achievement award". The Guardian. ^ Pullman, Philip. "The Great Escape". Retrieved 21 January 2014. ^ a b Merrill, Jamie (10 June 2008). "Author sets up book cover protest". Oxford Mail. Oxford. Retrieved 2 December 2014. ^ Flood, Alison (16 March 2013). "Campaign to end gender-specific children's books gathers support". The Guardian. London. Retrieved 2 December 2014. ^ The Convention on Modern Liberty. Modernliberty.net (2009-02-28). Retrieved on 2012-01-02. ^ Pullman, Philip (27 February 2009). "Malevolent voices that despise our freedoms". The Times. London. Retrieved 22 May 2010. ^ School safety 'insult' to Pullman. BBC News (2009-07-16). Retrieved on 2012-01-02. ^ Watt, Nicholas (31 July 2011). "Public jury campaign launched to take power away from UK's 'feral' elite". The Guardian. London. Retrieved 2 December 2014. ^ a b Flood, Alison (24 October 2011). "Philip Pullman declares war against 'stupidity' of library closures". The Guardian. London. Retrieved 2 December 2014. ^ Flood, Alison (12 June 2013). "Philip Pullman: 'Authors must be paid fairly for ebook library loans'". The Guardian. London. Retrieved 2 December 2014. ^ Flood, Alison (28 November 2014). "Time is running out for campaign to buy William Blake's home". The Guardian. London. Retrieved 2 December 2014. ^ Clark, Nick (14 January 2016). "Philip Pullman quits as Oxford Literary Festival refuses to pay its guest authors". The Independent. London. Retrieved 15 January 2016. ^ a b Miller, Laura. "'Far From Narnia'" (Life and Letters article). The New Yorker. Retrieved 31 October 2007. he is one of England’s most outspoken atheists. ... Opposed to this ideal is “theocracy,” which he defined as encompassing everything from Khomeini’s Iran to explicitly atheistic states such as Stalin’s Soviet Union. ^ a b "Sympathy for the Devil by Adam R. Holz". Plugged In Online. Archived from the original on 21 February 2014. Retrieved 14 September 2013. I suppose technically, you'd have to put me down as an agnostic. ^ Spanner, Huw (13 February 2002). "Heat and Dust". ThirdWay.org.uk. Archived from the original on 10 March 2007. Retrieved 5 April 2007. ^ Bakewell, Joan (2001). "Belief". BBC News Online. Archived from the original on 11 September 2004. Retrieved 5 April 2007. ^ Whittaker, Jason. (2010-04-09) His Dark Materials – Blake and Pullman. Zoamorphosis.com. Retrieved on 2012-01-02. ^ "Philip Pullman awarded for services to Humanism". British Humanist Association. Retrieved 7 March 2017. ^ "The Guardian: Harsh judgments on the pope and religion". London: The Guardian. 15 September 2010. Retrieved 16 September 2010. ^ Cathy Young (March 2008). "A Secular Fantasy - The flawed but fascinating fiction of Philip Pullman". Reason.com. Retrieved 28 March 2016. At first he asserts, very much in the vein of Dawkins and Hitchens, that faith in one God is itself the source of evil: “Every single religion that has a monotheistic god ends up by persecuting other people and killing them because they don’t accept him.” Asked about the crimes committed by atheistic totalitarian regimes, Pullman responds that “they functioned psychologically in exactly the same way,” with their own sacred texts and exalted prophets: “The fact that they proclaimed that there was no God didn’t make any difference: it was a religion, and they acted in the way any totalitarian religious system would.” ... When he finally acknowledges that “the religions are special cases of the general human tendency to exalt one doctrine above all others,” it comes across less as a reconsideration of his views than as a grudging concession. There are no reports of Pullman’s plans to write a sequel to His Dark Materials in which the attempt to build an earthly Republic of Heaven ends in firing squads and gulags. ^ "Mars Hill Audio – Audition – Program 10". Retrieved 13 November 2007. ^ ""The Golden Compass" Sparks Protest". Catholic League for Religious and Civil Rights. Archived from the original on 19 September 2011. ^ Jennifer Mesko. "Golden Compass Reveals a World Where There is No God". Focus on the Family citizenlink.com. Archived from the original on 11 October 2007. Retrieved 7 December 2006. ^ Caldecott, Leonie (29 October 1999). "The stuff of nightmares". Catholic Herald. Retrieved 15 January 2014. ^ a b "Oxford's Rebel Angel". Vanity Fair. October 2002. Retrieved 15 January 2014. ^ "A dark agenda?". surefish.co.uk. November 2002. Retrieved 15 January 2014. ^ Johnson, Sarah (1 February 2002). "Closing children's minds". Catholic Herald. Archived from the original on 16 January 2014. Retrieved 15 January 2014. ^ Farrell, Christina (26 December 2003). "Challenge to BBC over book allegation". Catholic Herald. Archived from the original on 18 December 2013. Retrieved 15 January 2014. ^ Caldecott, Leonie (26 December 2003). "The Big Read and the big lie". Catholic Herald. Retrieved 15 January 2014. ^ Caldecott, Leonie (October 2003). "Paradise Denied - Philip Pullman & the Uses & Abuses of Enchantment". Touchstone Magazine. Retrieved 15 January 2014. ^ Hitchens, Peter. "'This is the most dangerous author in Britain'". The Mail on Sunday. Archived from the original (Mail on Sunday article) on 15 February 2009. Retrieved 21 September 2006. ^ a b Wartofsky, Alona (19 February 2001). "The Last Word". The Washington Post. Retrieved 29 November 2007. ^ Hitchens, Peter. "A labour of loathing" (Spectator article). The Spectator]. Retrieved 21 September 2006. ^ Crary, Duncan. "The Golden Compass Author Avoids Atheist Labels". Humanist Network News. Archived from the original (Humanist Network News Interview) on 8 December 2007. Retrieved 1 December 2008. ^ Hitchens, Christopher (9 July 2010). "In the Name of the Father, the Sons ..." The New York Times. Retrieved 30 June 2017. ^ Petre, Jonathan (10 March 2004). "Williams backs Pullman". Daily Telegraph. UK. Retrieved 12 April 2007. ^ Rowan, Williams (10 March 2004). "Archbishop wants Pullman in class". BBC News Online. Retrieved 10 March 2004. ^ Oborne, Peter (17 March 2004). "The Dark Materials debate: life, God, the universe..." Daily Telegraph. UK. Retrieved 1 April 2008. ^ Bruner, Kurt & Ware, Jim. "'Shedding Light on His Dark Materials'" (Tyndale Products review). Tyndale. Retrieved 1 October 2007. ^ Collett-White, Mike (28 March 2010). "Pullman Risks Christian Anger With Jesus Novel". Reuters. Retrieved 15 January 2014. ^ "Default Parallels Plesk Panel Page". tbtproject.com. ^ "Philip Pullman's Dark Materials spin-off Secret Commonwealth gets release date". Digital Spy. 14 February 2017. Retrieved 27 February 2018. ^ "The Phoenix Issue 228: the weekly story comic". The Phoenix online shop. David Fickling Comics Ltd. Archived from the original on 14 January 2017. Retrieved 16 December 2017. ^ "The Adventures of John Blake: Mystery of the Ghost Ship". The Phoenix online shop. David Fickling Comics Ltd. Archived from the original on 16 December 2017. Retrieved 16 December 2017. ^ "The Adventures of John Blake: Mystery of the Ghost Ship". Scholastic Corporation. Archived from the original on 16 December 2017. Retrieved 16 December 2017. Hugh Rayment-Pickard, The Devil’s Account: Philip Pullman and Christianity (London, Darton, Longman and Todd, 2004). Lenz, Millicent (2005). His Dark Materials Illuminated: Critical Essays on Phillip Pullman's Trilogy. Wayne State University Press. ISBN 0-8143-3207-2. Wheat, Leonard F. Philip Pullman's His Dark Materials – A Multiple Allegory: Attacking Religious Superstition in The Lion, the Witch and the Wardrobe and Paradise Lost. Robert Darby: Intercision-Circumcision: His Dark Materials, a disturbing allegory of genital mutilation . Gerald O’Collins SJ., Philip Pullman's Jesus (London, Darton, Longman and Todd, 2010). "Philip Pullman: a life in writing", The Guardian, 4 March 2011, "Young fans ask Philip Pullman questions"
"Interview: Philip Pullman: new brand of environmentalism", The Daily Telegraph, 19 January 2008, "Paradise regained" Extract from interview with Pullman in Do Good Lives Have to Cost the Earth?" "Article: Philip Pullman: Kill humans and ration heating", The Register, 21 January 2008, "This is a crisis as big as war"
"Article: Pullman criticises modern fiction", The Guardian, 12 August 2002, "Fiction becoming trivial and worthless, says top author"